IND vs AUS 1st Test Day 4 Highlights: A cracker of a fifth day will be in store as all three results remain a possibility in Adelaide. IND vs AUS 1st Test Day 4 Highlights: Australia were always expected to have a hard time chasing down 323 in Adelaide. The openers Aaron Finch, who survived an LBW appeal with Ishant Sharma overstepping, and Marcus Harris gave a good start, before R Ashwin weaved his magic. The off-spinner dismissed Finch right at the stroke of Tea, and then the danger man Usman Khawaja. Mohammed Shami removed Harris and Handscomb Australia find themselves in a spot of bother. Shaun Marsh and Peter Handscomb took Australia to 104/4 at stumps. Earlier, India’s lower order took a fall as the visitors lost five wickets for just 25 runs and were bowled out for 307, with a lead of 322 runs. Nathan Lyon picked up six wickets in the innings. Shaun Marsh and Travis Head play out the rest of the day. Australia reach 104/4 at stumps on Day 4 and still need 219 runs to win. India will have a relatively easier job of picking 6 wickets if they want to win the match. We are in store for an exciting final day in the Adelaide Test in which both teams will be tested. Australia have reached the 100-run mark and this is starting to get a lot closer now. The hosts still need 219 runs more to win and the final day is about to get a tad bit more exciting on Monday. There was an injury scare for Jasprit Bumrah but he seems to be okay now. In fact, he will be bowling a few overs before the stumps. Big blow to India as Jasprit Bumrah has developed a shoulder strain and he has been taken off the field by the physios. We will give more information as this situation develops. Peter Handscomb and Shaun Marsh have added 24 runs in 13 overs. They are defending well at the moment. India need to break this partnership soon. Peter Handscomb hits it straight to KL Rahul at short leg. But there was too much power in it and it was not possible for Rahul to close his hands. Can Australia defy the odds? Mitchell Marsh and Peter Handscomb are on full-on defensive mode as they are trying to play out the remaining overs of the day. The duo have saved the match for Aussies before. FOUR! A full length delivery from R Ashwin and Shaun Marsh sliced it towards the third man for a boundary. Beautiful late cut and he brings up fifty for Australia in style. Mohammed Shami pitches just outside off stump and manages to get a nick off Marcus Harris' bat. Cheteshwar Pujara dived to his left but it was too difficult to grasp. He got his hands on it and this will go down as a dropped catch. Usman Khawaja joins Marcus Harris in the middle and he will face the heat post-Tea session. He will be the key man here. Shami resumes the attack for India. WICKET! Ashwin provides the breakthrough and Aaron Finch has been caught by Rishabh Pant. He pressed forward to defend butthe unusual bounce struck the ball on his gloves and then flew in the air. BIG WICKET. Aaron Finch and Marcus Harris have given a good start as the duo have added 25 runs on the board together. They have brought down the required target below 300. Mohammed Shami into the attack - he is on a hat-trick! India make a change and it is R Ashwin who is in to replaced Jasprit Bumrah. Nathan Lyon took six wickets in the 2nd innings. Ashwin would want to have a similar impact here, if not more. Has India changed the momentum? India lost 5 wickets in just 25 runs and now Ishant Sharma gives a lifeline to Aaron Finch with a no ball. Suddenly, the pressure appears to be building on the hosts to defend the total. ISHANT SHARMA WHAT HAVE YOU DONE! Sharma wraps Aaron Finch on the pads and the umpire raised his fingers. But Finch was quick to seek a review. The replays showed thought that Sharma had overstepped. What a start to Aussies' chase. Ishant Sharma starts the attack for India with the ball. Aaron Finch and Marcus Harris out to open the innings for Australia. Around 50 overs remaining in the day. GONE! Mitchell Starc digs the final nail in the coffin as Ishant Sharma nicks a bouncer to Aaron Finch at short leg. India are all out for 307, with a lead of 322. Australia need 323 to win! WICKET! 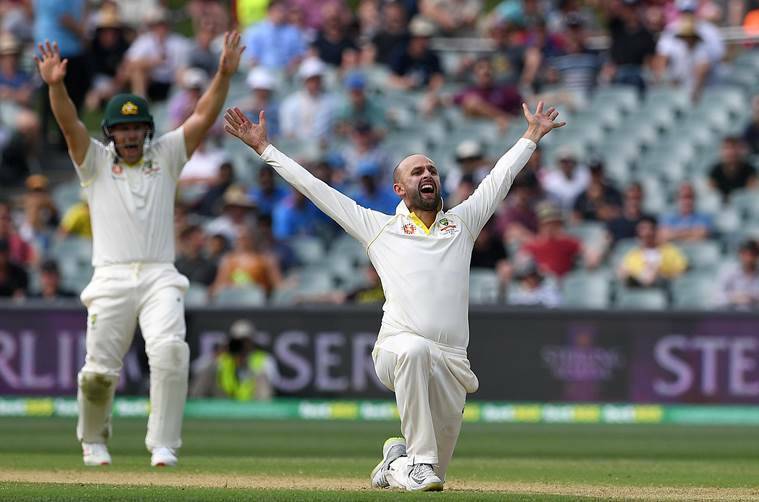 Mohammed Shami goes after Nathan Lyon - looks for the maximum but mistimed it. The ball goes straight to Marcus Harris at deep midwicket. Nathan Lyon is on a hat-trick. WICKET! Ajinkya Rahane plays a rare reverse sweep and gives an easy catch to Mitchell Starc at backward point. Rahane's fine innings of 70 comes to an end, and India are falling down like a heap now. WICKET! A short delivery from Mitchell Starc and Ravichandran Ashwin pulls it towards deep backward square. Could not get enough power and meat on the shot. A comfortable take for Marcus Harris. India 303/7, lead by 318 runs. India has now reached an important milestone - a lead of 300 runs in the match. This will further boost the confidence of Virat Kohli & Co. while also leaving Australia in further slump. Rishabh Pant is targetting Nathan Lyon. He has struck 18 runs in the first over after Lunch. Pant has been clearly instructed to go after the bowlers here and he is not missing out any opportunity here. Ajinkya Rahane and Rishabh Pant out to resume the innings for the second session - Nathan Lyon takes the ball. Exciting session in store with both teams in a chance to take total control here. Here is how Rohit Sharma was dismissed - with Peter Handscomb taking this beauty of a catch! The first session comes to an end - India reach 260/5 with a lead of 175 runs. 111 runs in the session with 2 wickets - Rahane and Pujara score fifties each and Nathan Lyon gets the two wickets. India in strong position - another good session and they will be in control. FIFTY! Ajinkya Rahane roars back to form with a well-made fifty. He reaches the milestone in style - with a boundary at deep midwicket. This is his 16th Test fifty - 12th away from home. This has been an outstanding, heartwarming innings from Pujara. If India go on to win this, the fans must remember this for a long time. In two overs, Mitchell Starc has strayed with his line twice and has given four byes twice - that is 8 easy runs for India. The hosts cannot afford that here, with the match slipping. Starc needs to buck up. Now, Australia have immediately taken the new ball and brought Mitchell Starc into the attack. Things could happen for the hosts now. Three slips and a gully for Rahane. Nathan Lyon has been the pick of Australian bowlers in this innings. He has thrice been denied by the DRS review - but he has been able to amp up the pressure everytime he has come out to bowl. The first hour of the day's play comes to an end - the players break for the drinks. So far, it has been completely India's day. Pujara and Rahane have added 58 runs together in the middle. But things could change soon - the new ball will be available after one over and the Australians might avail it immediately. Ajinkya Rahane and Cheteshwar Pujara are scoring runs at a fast pace in the first session on Day 4. It is Rahane who is going after the bowlers - it seems like clear instructions have been given to accelerate the scoring. IND vs AUS 1st Test Day 4 Highlights: Virat Kohli and Cheteshwar Pujara seemed to have put India in a strong position. But the Indian captain's fall in the dying minutes of the third day levelled the scales considerably and Australia will know that a couple of wickets would be enough to kick the gates open. Pujara's wicket will be top priority for them, the right-hander is grinding out another typically gritty fifty and is crucial to India's chances at inflating their lead.